Tarkin. The title of James Luceno’s recent novel on the life of the infamous Grand Moff best known for destroying Alderaan with the first Death Star is straight forward and to the point: much like the man that Luceno describes within it. Tarkin was released as one of the first entries into the ‘new’ Expanded Universe established by the Disney owned Lucasfilm. Previously, the Expanded Universe from the moment of Star Wars release in 1977, had been something haphazardly addressed, be it an ill-fated Christmas special to Marvel comics which attempted to fill the gaps between the movies. While the 1980s were filled with a variety of cartoons and even spin off movies, the idea of an Expanded Universe as something truly explored and defined didn’t take off until the early ‘90s and with the publication of the Thrawn trilogy written by Timothy Zahn. The popularity of the blue-skinned admiral launched a slew of new explorations into the universe of Star Wars that continued (for good or bad) up until the purchase of Lucasfilm by Disney. Upon that purchase, Disney opted to wipe the slate clean and declared the old Expanded Universe no longer canon (it was given the title of ‘Legends’ – don’t think about it, too long) and pushed to start anew. Now the Grand Moff, of notably paler skin, steps in to be the new herald of a new Expanded Universe. When was the last time we saw Tarkin? It’s a little bit of a trick question, depending on how deep into the Star Wars universe the reader has committed him or herself, too. If you have only seen the Original Trilogy, then your last glimpse was of Tarkin standing triumphantly at his greatest moment of victory an instant before the Death Star exploded courtesy a torpedo from a Tatooine farm boy. If you have only seen the Original Trilogy and the Prequel Trilogy, then you were served up a glance of a younger Tarkin at the end of Revenge of the Sith. If you have seen the films, but also engaged in the CGI animation Star Wars: The Clone Wars, you would have seen an even younger Tarkin, an officer of the Old Republic’s Navy fighting alongside Anakin Skywalker. Why does it matter? In truth, it matters so much as one’s enjoyment and appreciation of events that are recounted in the novel that are informed almost entirely from the animation. This is because every event that occurs cinematically is the prologue to the story presented in Tarkin, which serves a number of duties. First, it’s the background of Grand Moff Tarkin, how and why he who we came to know from his previous and aforementioned incarnations. Second, it’s surprisingly an Imperial-laced buddy adventure, in which he and Darth Vader are sent by the Emperor to solve a mystery that harkens back to the Clone Wars. Third, it helps sets the stage for the beginning of a nascent rebellion against the Empire, a rebellion that is emerging before our eyes in both printed form (A New Dawn) and on television screen (Star Wars: Rebels). Then the next question obviously is, how well does it perform these three tasks? For the first task, arguably the most important one, it does the job. For those who watched Star Wars: The Clone Wars, Tarkin, while somewhat grave and obviously in need of more calories, does not necessarily come across as a man who orders the execution of millions and the destruction of an entire planet without hesitation. How did he change into the monster that he became? We learn, ultimately, he didn’t change, so much as the younger Tarkin continued down a path of logic that has guided his life since his childhood. Granted a first name, Wilhuf, and a planet in the Outer Rim, Eriadu, Tarkin grows up a scion of one of the most powerful families on the planet. The Tarkin Clan holds to a sense of superiority, over nature and over other races, based on the pivotal role they played in developing the planet from an uninhabited globe full of resources but harsh terrain to an eager civilization hoping to join the ranks of the galaxy’s Core planets (see Coruscant). Tarkin’s background, offered in bits and pieces, rather than a continual chronology that begins with boy Tarkin and follows him through his younger years, is most informed by a particular Tarkin tradition – spending time in something akin to a private reserve of the family’s that’s on the scale of an American national park. Replace the buffalo and antelope with a variety of vicious creatures and you have training ground in how to raise children to appreciate and adopt an ethos of superiority via outwitting and surviving in its harsh terrain. In his survival, young Tarkin learns and appreciates the presence of a natural order of things. Tarkin’s uncle serves as his mentor in the wilds, introducing him quickly to the new world by requiring Tarkin as a boy to slaughter an animal and eat its still warm innards. The experience helped gift Tarkin with a mind bent toward strategy and a focus on a world best controlled by strong leadership and coerced by fear and intimidation. Order becomes Tarkin’s byword, and those who oppose it, his enemies. Thus, while in his younger years, the enemies to the order of his planet and system were pirates, who were systematically stopped and wiped out by Tarkin, in time, it makes sense that he would view an entire planet’s populace as similar opponents to the order being put in place by the Galactic Empire. His is very much a meteoric rise and Luceno never presents the future Grand Moff as a villain, so much presents the man to the reader and allows us to make that decision. In the course of that rise, he comes across the sights of another from an Outer Rim planet, Senator Palpatine of Naboo. The Prequel Trilogy accounted for Palpatine’s rise, and Tarkin consciously or not, found his own fortunes rising on Palptaine’s tide. It’s then not a surprise that Tarkin is paired by the Emperor (five years after Revenge of the Sith) with the Emperor’s right hand, Darth Vader. The two are brought together for the purpose of investigating the connection between an attack on Tarkin’s secret base (where a certain super weapon is in the process of being constructed) and the discovery of communication equipment on a planet formerly of the Separatist Movement (the guys generally portrayed as the ‘bad guys’ in the Prequel Trilogy, but granted more graying in Star Wars: The Clone Wars). The mystery aspect of this mission is competently written by Luceno, allowing a fair pacing between revealing the next clue against treading water to avoid an early solution. Yet, the mystery generally serves to bring Tarkin and Vader together to create a level of mutual respect that will later be seen in Star Wars, when Tarkin demands Vader cease Force choking one of his generals and Vader does so immediately. Vader is perhaps the weakest link of this pairing, not from what or how he does things, but because participating in this scenario helps to humanize him, no matter how often Luceno references Vader’s inhuman appearance. Vader, as a masked nemesis, remains alien and as such, uncomfortable to the viewer; we cannot associate with him and therefore, he becomes all the more terrifying. When he’s not the Sith Lord barking commands and threatening others, he’s diminished. There is a thing as too much Darth Vader and Tarkin threatens to bump up against that barrier. It’s a paradox, because we know that underneath the armor is Anakin Skywalker, person, but the beauty of Luke removing his mask in Return of the Jedi, represents the transition of Vader the monster into Vader the person. On Star Wars: Rebels, Vader’s representation has been much more in line with the Original Trilogy, and arguably, so far, more frightening. The second task of pairing the two is not an overwhelming success, based on the above, but it does work out. 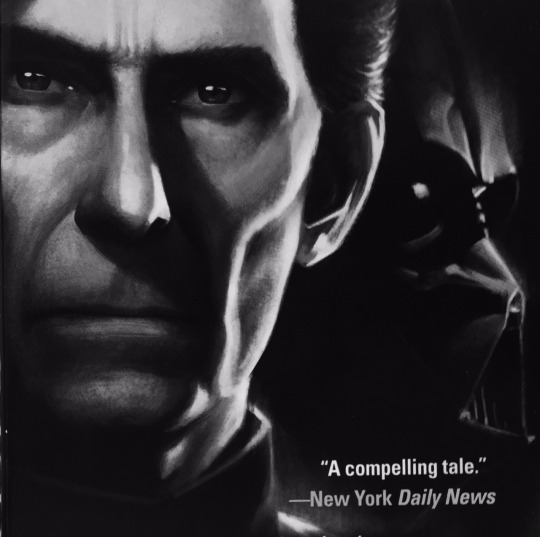 Lucerno does an admirable job of allowing the reader to see Vader through the eyes of Tarkin, who is not written as a fool and is allowed insight into the mystery at that point of time, into who or what Darth Vader actually is. The final task, representing the nascent beginnings of the Rebel Alliance, does work as we witness the grouping of a variety of aliens and humans bent on revenge upon the Empire for its crimes against others. In this instance, we have a Mon Calamari involved in setting a trap, rather than falling into it. While ‘rebels’ may be prematurely a label for the group, Luceno does try to imbue them with character and not one dimensional figurines that serve entirely to be the at first unknown agents of trouble for Tarkin and Vader, and later the prey (and for a moment, attempted predators). The novel is not called Rebels, however, and so most carry on as the ancillary characters we identify them as and as their fates come and go, there is little to make the reader truly care about them. But, overall, the novel does work in laying out that the conclusion of the Clone Wars does not mean the end of problems for the Empire. Tarkin is 314 pages long and reads fairly well. While the origin of the man who would instill order throughout the galaxy by fear of his world destroying battle station is not quite complicated, it’s genuine without being generic. Luceno succeeds in presenting a portrait that is amoral of a man that can quite honestly be deemed evil. Tarkin is not the hero of his self-styled titled novel, but is surprisingly an entertaining protagonist, no matter how much one may be horrified at his unfolding philosophy of terror. 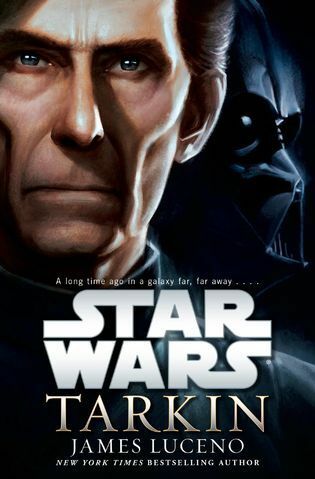 Tarkin is worth a read for the Star Wars fan, but perhaps not for those less than passionately engaged in the universe. It’s a good start, but not the Thrawn Trilogy to initiate another incredible expansion of the Expanded Universe.